The mermaid, a creature formed from the upper body of a woman and the tail of a fish, has long been a legendary figure in folklore. From animated films to the sea creatures of sailor lore, the mermaid has been the subject of speculation and admiration. This green-glazed bowl with silver trim designed by Wilhelm Kåge of Sweden features the mythological being wielding a spear, seemingly in mid-attack, challenging the mermaid’s reputation as a non-aggressive creature. There are many different versions of mermaids throughout mythology, and Scandinavian folklore is no exception. 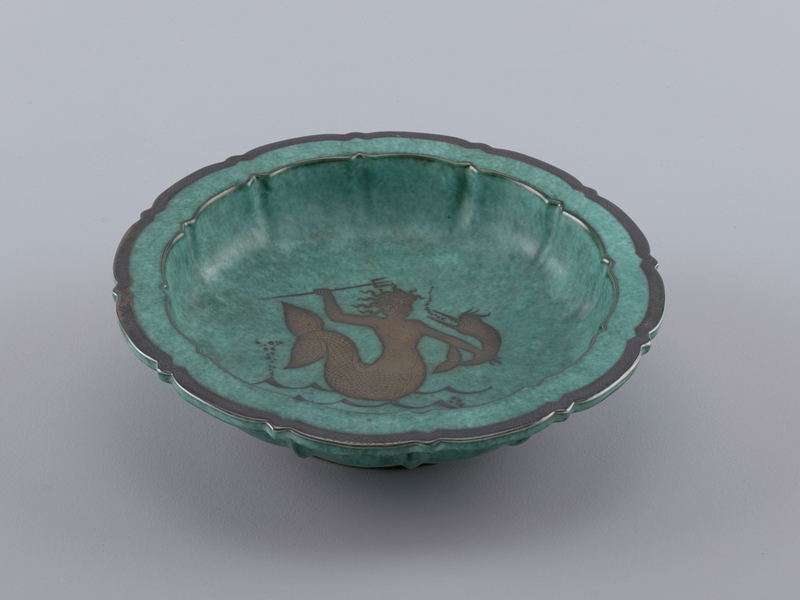 While it is common for mermaids to be part of the legend of saving sailors from unruly storms or sitting upon rocks and combing their hair, the creature depicted on this bowl does not seem to follow this narrative, with her fierce weapon and firm grasp upon a swordfish. It is possible that she is meant to resemble the havsrå, an aquatic counterpart of the huldra, a dangerous seductress who lives in the forest, very present in Scandinavian folklore tales. With an irresistible power to entice men, if she leads them to marriage in a church, her tail falls off and she becomes human. Mermaids also have similarities to Lorelai, another feminine water spirit who lures men to their deaths. Whichever creature of folklore this bowl is meant to resemble, it is clear that mythological creatures play a large role in Swedish imagery, even in industrial design. Kåge is largely known as the artistic director of the Gustavsberg porcelain factory. He studied painting in Stockholm and later with the painter Carl. W. Wilhemson in Gothenburg. Presented with the Prince Eugen Medal for design in 1949, he is renowned for his work in ceramics. The Argenta series, named for the Latin word for silver, was the most commercially successful of his work at the Gustavsberg factory, and it included everything from ashtrays to urns. The green and silver combination as seen here in the bowl was the most popular. Hired by the factory in 1917 after an exhibition of his works in Stockholm, he was commissioned to bring an artistic touch to the factory’s wares, to create “more beautiful everyday products.” First shown at the Stockholm Exhibition in 1930, the Argenta series became a major success, and the silver and green glaze was considered the epitome of Swedish Grace. Eventually branching out into other variants such as the white Grazia, the popularity of Argenta ware became so overwhelming that Gustavsberg created a department specifically for the manufacture of the series. Erin Benedictson was an Alberta-Smithsonian curatorial intern in the Product Design and Decorative Arts department at Cooper-Hewitt, Smithsonian Design Museum. Cooper-Hewitt Museum, The Smithsonian Institution’s National Museum of Design, New York, David Revere McFadden, ed. (New York: Harry N. Abrams, Inc.), 121.